I’m only half way through Justice Clarence Thomas’s concuring opinion in the recent 2nd amendment case "M c DONALD et al. v . CITY OF CHICAGO, ILLINOIS", but from what I’ve read so far, it’s an excellent defense of the Constitution itself, and our ability to understand and apply it. I thought that since it formulates a defense of our 2nd Amendments rights, it’s particularly well suited for consideration on this day, the Fourth of July, when the people of the United States of America first declared their independence from the control of tyrants. Truth be told, I also didn't mind that he makes mention of he importance of the Slaughter-Houses cases, and Lochner v New York, which I cited here, regarding their importance in diminishing the understanding of our rights and distancing us from being able to count on a sound constitutional defense for our liberties. Once again Thomas shows himself to be a far better judicial mind than either of the more renowned (and timid) 'originalists' Scalia, Roberts or Alito, are. 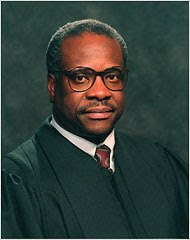 Justice Thomas is the only one who ventures to state what it seems that the other conservative Justices suspect to be true, but aren't willing or able to support, that the sleight of hand that has with over a hundred years of creaking precedent, attached to the magical 'due process' clause, along with willfully anemic interpretations of the 'Privileges and Immunities' clause of the 14th amendment, are simply excuses for rationalizing desired pet results out of the constitution, while it is the full understanding of the Privileges and Immunities clause, that is the only proper conduit for the Federal Bill of Rights to be applied down to and within the individual states, and is the only method which won't also lead to an erosion of the powers of the states. “...It cannot be presumed that any clause in the constitution is intended to be without effect.” Marbury v. Madison , 1 Cranch 137, 174 (1803) (Marshall, C. J.). Because the Court’s Privileges or Immunities Clause precedents have presumed just that, I set them aside for the moment and begin with the text. The Privileges or Immunities Clause of the Fourteenth Amendment declares that “[n]o State . . . shall abridge the privileges or immunities of citizens of the United States.” In interpreting this language, it is important to recall that constitutional provisions are “ ‘written to be understood by the voters.’ ” Heller , 554 U. S., at ___ (slip op., at 3) (quoting United States v. Sprague , 282 U. S. 716, 731 (1931) ). Thus, the objective of this inquiry is to discern what “ordinary citizens” at the time of ratification would have understood the Privileges or Immunities Clause to mean. 554 U. S., at ___ (slip op., at 3). At the time of Reconstruction, the terms “privileges” and “immunities” had an established meaning as synonyms for “rights.” The two words, standing alone or paired together, were used interchangeably with the words “rights,” “liberties,” and “freedoms,” and had been since the time of Blackstone. See 1 W. Blackstone, Commentaries *129 (describing the “rights and liberties” of Englishmen as “private immunities” and “civil privileges”). A number of antebellum judicial decisions used the terms in this manner. The fact that a particular interest was designated as a “privilege” or “immunity,” rather than a “right,” “liberty,” or “freedom,” revealed little about its substance. Blackstone, for example, used the terms “privileges” and “immunities” to describe both the inalienable rights of individuals and the positive-law rights of corporations. See 1 Commentaries, at *129 (describing “private immunities” as a “ residuum of natural liberty,” and “civil privileges” as those “which society has engaged to provide, in lieu of the natural liberties so given up by individuals” (footnote omitted)); id. , at *468 (stating that a corporate charter enables a corporation to “establish rules and orders” that serve as “the privileges and immunities . . . of the corporation”). Writers in this country at the time of Reconstruction followed a similar practice. See, e.g. , Racine & Mississippi R. Co. v. Farmers’ Loan & Trust Co. , 49 Ill. 331, 334 (1868) (describing agreement between two railroad companies in which they agreed “ ‘to fully merge and consolidate the[ir] capital stock, powers, privileges, immunities and franchises’ ”); Hathorn v. Calef , 53 Me. 471, 483–484 (1866) (concluding that a statute did not “modify any power, privileges, or immunity, pertaining to the franchise of any corporation”). The nature of a privilege or immunity thus varied depending on the person, group, or entity to whom those rights were assigned. See Lash, The Origins of the Privileges or Immunities Clause, Part I: “Privileges and Immunities” as an Antebellum Term of Art, 98 Geo. L. J. 1241, 1256–1257 (2010) (surveying antebellum usages of these terms). The group of rights-bearers to whom the Privileges or Immunities Clause applies is, of course, “citizens.” By the time of Reconstruction, it had long been established that both the States and the Federal Government existed to preserve their citizens’ inalienable rights, and that these rights were considered “privileges” or “immunities” of citizenship. "... As the Court explains, if this case were litigated before the Fourteenth Amendment ’s adoption in 1868, the answer to that question would be simple. In Barron ex rel. Tiernan v. Mayor of Baltimore , 7 Pet. 243 (1833), this Court held that the Bill of Rights applied only to the Federal Government. Writing for the Court, Chief Justice Marshall recalled that the founding generation added the first eight Amendments to the Constitution in response to Antifederalist concerns regarding the extent of federal—not state—power, and held that if “the framers of these amendments [had] intended them to be limitations on the powers of the state governments,” “they would have declared this purpose in plain and intelligible language.” Id. , at 250. Finding no such language in the Bill, Chief Justice Marshall held that it did not in any way restrict state authority. Id. , at 248–250; see Lessee of Livingston v. Moore , 7 Pet. 469, 551–552 (1833) (reaffirming Barron ’s holding); Permoli v. Municipality No. 1 of New Orleans , 3 How. 589, 609–610 (1845) (same). Nearly three decades after Barron , the Nation was splintered by a civil war fought principally over the question of slavery. As was evident to many throughout our Nation’s early history, slavery, and the measures designed to protect it, were irreconcilable with the principles of equality, government by consent, and inalienable rights proclaimed by the Declaration of Independence and embedded in our constitutional structure. See, e.g. , 3 Records of the Federal Convention of 1787, p. 212 (M. Farrand ed. 1911) (remarks of Luther Martin) (“[S]lavery is inconsistent with the genius of republicanism, and has a tendency to destroy those principles on which it is supported, as it lessens the sense of the equal rights of mankind” (emphasis deleted)); A. Lincoln, Speech at Peoria, Ill. (Oct. 16, 1854), reprinted in 2 The Collected Works of Abraham Lincoln 266 (R. Basler ed. 1953) (“[N]o man is good enough to govern another man, without that other’s consent . I say this is the leading principle—the sheet anchor of American republicanism. . . . Now the relation of masters and slaves is, pro tanto , a total violation of this principle”). After the war, a series of constitutional amendments were adopted to repair the Nation from the damage slavery had caused. The provision at issue here, §1 of the Fourteenth Amendment , significantly altered our system of government. The first sentence of that section provides that “[a]ll persons born or naturalized in the United States and subject to the jurisdiction thereof, are citizens of the United States and of the State wherein they reside.” This unambiguously overruled this Court’s contrary holding in Dred Scott v. Sandford , 19 How. 393 (1857), that the Constitution did not recognize black Americans as citizens of the United States or their own State. Id. , at 405–406. The meaning of §1’s next sentence has divided this Court for many years. That sentence begins with the command that “[n]o State shall make or enforce any law which shall abridge the privileges or immunities of citizens of the United States.” On its face, this appears to grant the persons just made United States citizens a certain collection of rights— i.e. , privileges or immunities—attributable to that status. This Court’s precedents accept that point, but define the relevant collection of rights quite narrowly. In the Slaughter-House Cases , 16 Wall. 36 (1873), decided just five years after the Fourteenth Amendment ’s adoption, the Court interpreted this text, now known as the Privileges or Immunities Clause, for the first time. In a closely divided decision, the Court drew a sharp distinction between the privileges and immunities of state citizenship and those of federal citizenship, and held that the Privileges or Immunities Clause protected only the latter category of rights from state abridgment. Id. , at 78. The Court defined that category to include only those rights “which owe their existence to the Federal government, its National character, its Constitution, or its laws.” Id. , at 79. This arguably left open the possibility that certain individual rights enumerated in the Constitution could be considered privileges or immunities of federal citizenship. See ibid. (listing “[t]he right to peaceably assemble” and “the privilege of the writ of habeas corpus ” as rights potentially protected by the Privileges or Immunities Clause). But the Court soon rejected that proposition, interpreting the Privileges or Immunities Clause even more narrowly in its later cases. Chief among those cases is United States v. Cruikshank , 92 U. S. 542 (1876) . There, the Court held that members of a white militia who had brutally murdered as many as 165 black Louisianians congregating outside a courthouse had not deprived the victims of their privileges as American citizens to peaceably assemble or to keep and bear arms. Ibid. ; see L. Keith, The Colfax Massacre 109 (2008). According to the Court, the right to peaceably assemble codified in the First Amendment was not a privilege of United States citizenship because “[t]he right . . . existed long before the adoption of the Constitution.” 92 U. S., at 551 (emphasis added). Similarly, the Court held that the right to keep and bear arms was not a privilege of United States citizenship because it was not “in any manner dependent upon that instrument for its existence.” Id. , at 553. In other words, the reason the Framers codified the right to bear arms in the Second Amendment —its nature as an inalienable right that pre-existed the Constitution’s adoption—was the very reason citizens could not enforce it against States through the Fourteenth. That circular reasoning effectively has been the Court’s last word on the Privileges or Immunities Clause. 1 In the intervening years, the Court has held that the Clause prevents state abridgment of only a handful of rights, such as the right to travel, see Saenz v. Roe , 526 U. S. 489, 503 (1999) , that are not readily described as essential to liberty. As a consequence of this Court’s marginalization of the Clause, litigants seeking federal protection of fundamental rights turned to the remainder of §1 in search of an alternative fount of such rights. They found one in a most curious place—that section’s command that every State guarantee “due process” to any person before depriving him of “life, liberty, or property.” At first, litigants argued that this Due Process Clause “incorporated” certain procedural rights codified in the Bill of Rights against the States. The Court generally rejected those claims, however, on the theory that the rights in question were not sufficiently “fundamental” to warrant such treatment. See, e.g. , Hurtado v. California , 110 U. S. 516 (1884) (grand jury indictment requirement); Maxwell v. Dow , 176 U. S. 581 (1900) (12-person jury requirement); Twining v. New Jersey , 211 U. S. 78 (1908) (privilege against self-incrimination). That changed with time. The Court came to conclude that certain Bill of Rights guarantees were sufficiently fundamental to fall within §1’s guarantee of “due process.” These included not only procedural protections listed in the first eight Amendments, see, e.g. , Benton v. Maryland , 395 U. S. 784 (1969) (protection against double jeopardy), but substantive rights as well, see, e.g. , Gitlow v. New York , 268 U. S. 652, 666 (1925) (right to free speech); Near v. Minnesota ex rel. Olson , 283 U. S. 697, 707 (1931) (same). In the process of incorporating these rights against the States, the Court often applied them differently against the States than against the Federal Government on the theory that only those “fundamental” aspects of the right required Due Process Clause protection. See, e.g. , Betts v. Brady , 316 U. S. 455, 473 (1942) (holding that the Sixth Amendment required the appointment of counsel in all federal criminal cases in which the defendant was unable to retain an attorney, but that the Due Process Clause required appointment of counsel in state criminal cases only where “want of counsel . . . result[ed] in a conviction lacking in . . . fundamental fairness”). In more recent years, this Court has “abandoned the notion” that the guarantees in the Bill of Rights apply differently when incorporated against the States than they do when applied to the Federal Government. Ante , at 17–18 (opinion of the Court) (internal quotation marks omitted). But our cases continue to adhere to the view that a right is incorporated through the Due Process Clause only if it is sufficiently “fundamental,” ante , at 37, 42–44 (plurality opinion)—a term the Court has long struggled to define. While this Court has at times concluded that a right gains “fundamental” status only if it is essential to the American “scheme of ordered liberty” or “ ‘deeply rooted in this Nation’s history and tradition,’ ” ante , at 19 (plurality opinion) (quoting Glucksberg , 521 U. S., at 721), the Court has just as often held that a right warrants Due Process Clause protection if it satisfies a far less measurable range of criteria, see Lawrence v. Texas , 539 U. S. 558, 562 (2003) (concluding that the Due Process Clause protects “liberty of the person both in its spatial and in its more transcendent dimensions”). Using the latter approach, the Court has determined that the Due Process Clause applies rights against the States that are not mentioned in the Constitution at all, even without seriously arguing that the Clause was originally understood to protect such rights. See, e.g. , Lochner v. New York , 198 U. S. 45 (1905) ; Roe v. Wade , 410 U. S. 113 (1973) ; Lawrence , supra . All of this is a legal fiction. The notion that a constitutional provision that guarantees only “process” before a person is deprived of life, liberty, or property could define the substance of those rights strains credulity for even the most casual user of words. Moreover, this fiction is a particularly dangerous one. The one theme that links the Court’s substantive due process precedents together is their lack of a guiding principle to distinguish “fundamental” rights that warrant protection from nonfundamental rights that do not. Today’s decision illustrates the point. Replaying a debate that has endured from the inception of the Court’s substantive due process jurisprudence, the dissents laud the “flexibility” in this Court’s substantive due process doctrine, post , at 14 ( STEVENS, J., dissenting); see post , at 6–8 ( BREYER, J., dissenting), while the plurality makes yet another effort to impose principled restraints on its exercise, see ante , at 33–41. But neither side argues that the meaning they attribute to the Due Process Clause was consistent with public understanding at the time of its ratification. To be sure, the plurality’s effort to cabin the exercise of judicial discretion under the Due Process Clause by focusing its inquiry on those rights deeply rooted in American history and tradition invites less opportunity for abuse than the alternatives. See post , at 7 ( BREYER, J., dissenting) (arguing that rights should be incorporated against the States through the Due Process Clause if they are “well-suited to the carrying out of . . . constitutional promises”); post , at 22 (STEVENS, J., dissenting) (warning that there is no “all-purpose, top-down, totalizing theory of ‘liberty’ ” protected by the Due Process Clause). But any serious argument over the scope of the Due Process Clause must acknowledge that neither its text nor its history suggests that it protects the many substantive rights this Court’s cases now claim it does. I cannot accept a theory of constitutional interpretation that rests on such tenuous footing. This Court’s substantive due process framework fails to account for both the text of the Fourteenth Amendment and the history that led to its adoption, filling that gap with a jurisprudence devoid of a guiding principle. I believe the original meaning of the Fourteenth Amendment offers a superior alternative, and that a return to that meaning would allow this Court to enforce the rights the Fourteenth Amendment is designed to protect with greater clarity and predictability than the substantive due process framework has so far managed. I acknowledge the volume of precedents that have been built upon the substantive due process framework, and I further acknowledge the importance of stare decisis to the stability of our Nation’s legal system. But stare decisis is only an “adjunct” of our duty as judges to decide by our best lights what the Constitution means. Planned Parenthood of Southeastern Pa. v. Casey , 505 U. S. 833, 963 (1992) (Rehnquist, C. J., concurring in judgment in part and dissenting in part). It is not “an inexorable command.” Lawrence , supra , at 577. Moreover, as judges, we interpret the Constitution one case or controversy at a time. The question presented in this case is not whether our entire Fourteenth Amendment jurisprudence must be preserved or revised, but only whether, and to what extent, a particular clause in the Constitution protects the particular right at issue here. With the inquiry appropriately narrowed, I believe this case presents an opportunity to reexamine, and begin the process of restoring, the meaning of the Fourteenth Amendment agreed upon by those who ratified it. If you are concerned with the status of the Constitution, and of how to defend it and our rights, Justice Thomas's opinion is one that is well worth your time to read. Hope you all enjoyed a Happy Fourth of July! But, but, we're not sure there IS a nstural law. Or, rather she refused to say there was. I've had reading his opinion on my list. Good post.